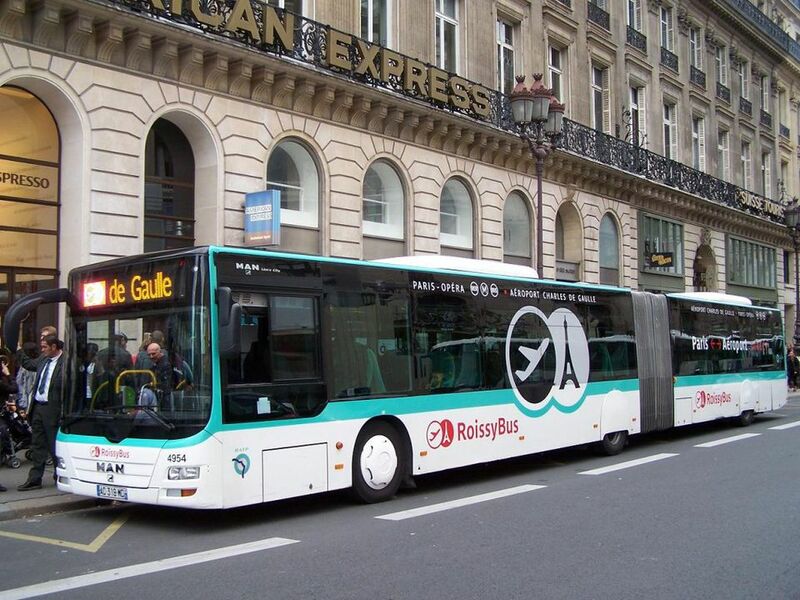 If you're trying to figure out the best way to get between the Paris city center and Roissy-Charles de Gaulle Airport, taking a dedicated bus line called the Roissybus can be a good option. Relatively affordable, reliable and efficient, this city-managed airport shuttle offers continuous and frequent service from early in the morning to late in the evening, seven days a week. Particularly when your hotel or other accommodations are situated close to the city center, the service can be more convenient and less stressful than other ground transportation options (you can see more about those by scrolling further down). While it doesn't offer the frills of some shuttle services, it's an all-around decent option for travelers on a modest budget who prefer to avoid taking the train. From central Paris, the bus departs daily from nearby the Palais Opera Garnier. The stop is located right outside the American Express office at 11, Rue Scribe (at the corner of Rue Auber). The metro stop is Opera or Havre-Caumartin, Look for a clearly marked "Roissybus" sign. From Charles de Gaulle, follow the signs reading "grand transportation" and "Roissybus" in the arrivals area at terminals 1, 2 and 3. The bus departs from the Rue Scribe/Opera Garnier stop starting at 5:15 am, with buses every 15 minutes until 8:00 pm. Between 8:00 pm to 10:00 pm, departures are every 20 minutes; from 10:00 pm to 12:30 am, service slows to 30-minute intervals. The journey takes about 60 to 75 minutes, depending on traffic conditions. From CDG, the Roissybus departs daily from 6:00 am to 8:45, leaving at 15 minute intervals, and between 8:45 pm to 12:30 am, every 20 minutes. There are several ways to purchase tickets (one-way or round-trip fares). You can buy them directly on the bus, but do keep in mind that you'll need to pay in cash; debit and credit cards are not accepted onboard. Tickets are also available for sale at any Paris Metro (RATP) station in the city, and at RATP counters at CDG Airport (terminals 1, 2B, and 2D). The ticket offices at the airport are open from 7:30 a.m. to 6:30 p.m. If you already have a "Paris Visite" metro ticket that covers zones 1-5, the ticket may be used for a Roissybus trip. Navigo transport passes may also be used. Are Reservations a Good Idea? Reservations aren't required, but it may be a good idea to buy your ticket in advance during times of heavy traffic and high tourist season (April through early October), as well as during the period around Christmas and New Year's Eve-- a tremendously popular time to visit the French capital. You can purchase tickets online here; you'll need to print out your ticket using your confirmation number at the airport or at any Paris metro station. When in doubt, visit the Information booth for assistance. Onboard services and amenities include air conditioning (extremely welcome during the hot, muggy summer months) and luggage racks. All buses are fully equipped with ramps for visitors with limited mobility. In the past, the bus has provided a free wifi connection, but it appears to not be in service at the moment. Unfortunately, the buses are not equipped with power outlets, so you may wish to fully charge your phone prior to boarding. Customer service agents for Roissybus can be reached by phone at: +33 (0)1 49 25 61 87 from Monday to Friday, 8.30 am to 5.30 pm (excepting public holidays). What Are Alternative Ways to Get to or From CDG Airport? Although the Roissybus service is very popular, it's far from your only choice: there are several airport ground transport options in Paris, some appreciably less expensive. Many travelers opt to take the RER B commuter line train from Charles de Gaulle to central Paris. Departing several times each hour, the train serves several major stops in the city: Gare du Nord, Chatelet-les-Halles, Luxembourg, Port Royal and Denfert-Rochereau. Tickets can be purchased at the RER station at CDG; follow the signs from the arrivals terminal. You can also take the same line from the city center to the airport, and you can procure tickets from any metro/RER station. The upside of taking the RER? It's a couple of Euros cheaper than the Roissybus, and takes considerably less time: 25-30 minutes vs 60-75 minutes for the bus. Òn the downside? Depending on the time of the day, the RER can be overcrowded and unpleasant, and isn't always accommodating for visitors with limited mobility. There's also the issue of having to lug suitcases and bags up and down metro and RER tunnel stairs, an athletic feat not everyone will appreciate. For travelers on a very tight budget, there are two additional city bus lines that serve CDG airport and offer much less expensive fares. Bus #350 departs from the Gare de L'est train station every 15-30 minutes and takes between 70-90 minutes. Bus #351 leaves from Place de la Nation in Southern Paris (Metro: Nation) every 15-30 minutes and takes about the same amount of time. Both currently cost 6 Euros for a one-way ticket, roughly half the fare for the Roissybus. Another coach option that's more upmarket than the Roissybus is Le Bus Direct (formerly Cars Air France), a shuttle service with several different routes between CDG and the city center, as well as direct connections between CDG and Orly Airport. At 17 Euros for a one way ticket, this is a pricier option, but you get more for your money: reliable free wi-fi, outlets to plug in your phone or other devices, and assistance with your luggage. The comfort and service is on par with a taxi, but this option will likely still be less expensive. The total journey time is about an hour, and tickets can be purchased online in advance. If you're departing from Paris, you can catch the bus at 1 Avenue Carnot, near Place de l'Etoile and the Champs-Elysées (Metro: Charles de Gaulle-Etoile). Traditional taxis are a last option, but can be pricey and take a significant amount of time depending on traffic conditions. This is, however, a good choice if you have large amounts of luggage or if there are passengers with significant mobility constraints. See more in our guide to taking taxis to and from the airport. Please note that ticket prices cited in this article were accurate at the time of publication, but may change at any time.